The condom ending machine started as an open source project (the plan can be found at Condom Vending Machine Wiki) for citizens of Ghana who are intimidated by the purchase of condoms. The machines are typically wall-mounted and made of plywood and aluminum or steel. 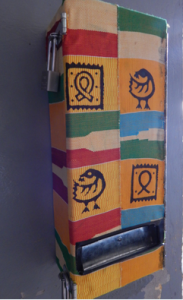 The goals that the condom vending machine strive to meet are to be able to provide a safe space for individuals to purchase condoms, provide unique entrepreneurial opportunities for Ghanaians and overall; to increase the use condoms thus reducing the widespread presence of sexually transmitted diseases. Pictured below is a condom vending machine presently in an HIV/AIDS clinic in Ghana. It is covered with a traditional patterned cloth that is stamped with modern twists of traditional Ghanaian adinkra symbols. We are sending our final design in the form of stickers to Ghana so they can easily replace the worn out cloth with an approachable and vibrant design that promotes condom use well maintaining a comfortable environment.